For Valentine’s Day, I knew I wanted to try a recipe I wouldn’t normally make. 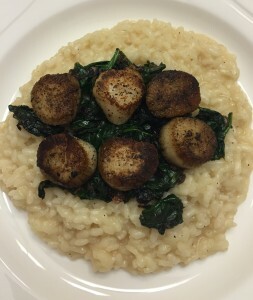 My sorority sister (and friend from high school), Jamie, recommended this Seared Scallops over Wilted Spinach and Parmesan Risotto recipe when I first posted about this recipe challenge. I thought it would be perfect! Now, let me just say that I’ve never made scallops OR risotto, so this was a stretch for me. I even watched a few YouTube videos on how to sear scallops. I felt prepared. I was ready. 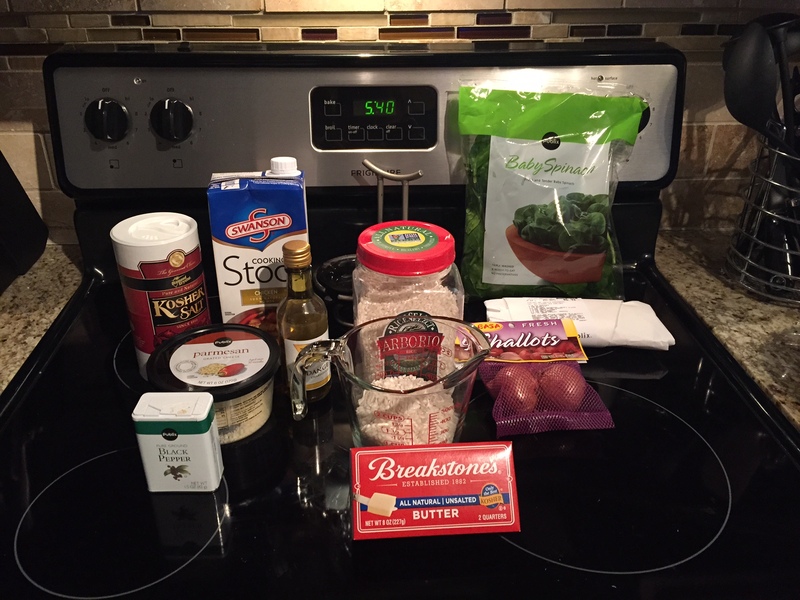 I started on the risotto first, since it was going to take the longest. (Side note: When I went looking for arborio rice, I literally stood in front of it for a few minutes before I noticed it. It took a Google search while standing in the aisle to find a product image, and then it jumped right out at me on the shelf). I tried chopping the shallots up by hand, but as I know I’ve mentioned many times before, I’m not a fan of cutting onions. I threw the one shallot in the food processor and let it chop that way…but when I took the lid off, my eyes starting BURNING. Yeesh! When the risotto was half-way ready, I turned my attention to the scallops, which I was most nervous about. I pulled out my cast iron pan, because I rarely use it and it seemed perfect for the task (and one of the videos I watched used one). Needless to say, I’m pretty clueless about cooking with cast iron (with the exception of our pizza stone, I have that one down). 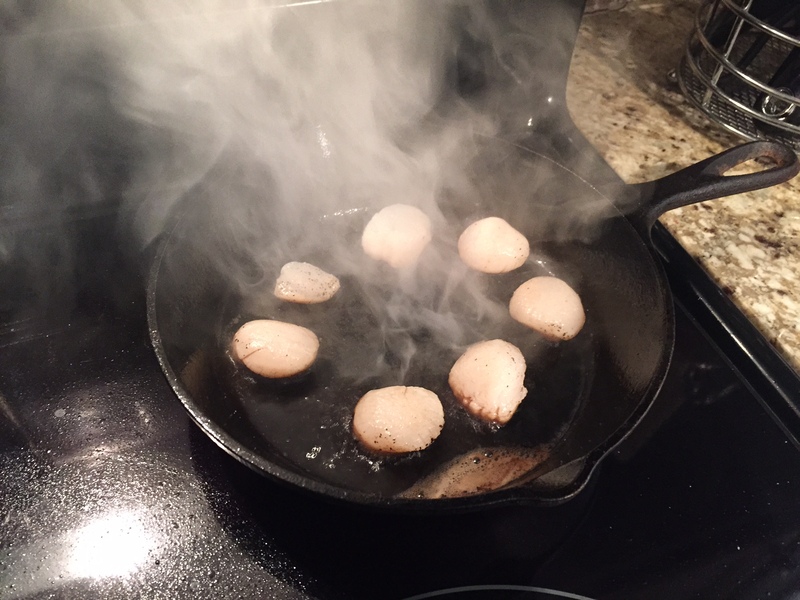 I put the oil in the pan and laid out 6 of the scallops, searing them for a minute on each side. 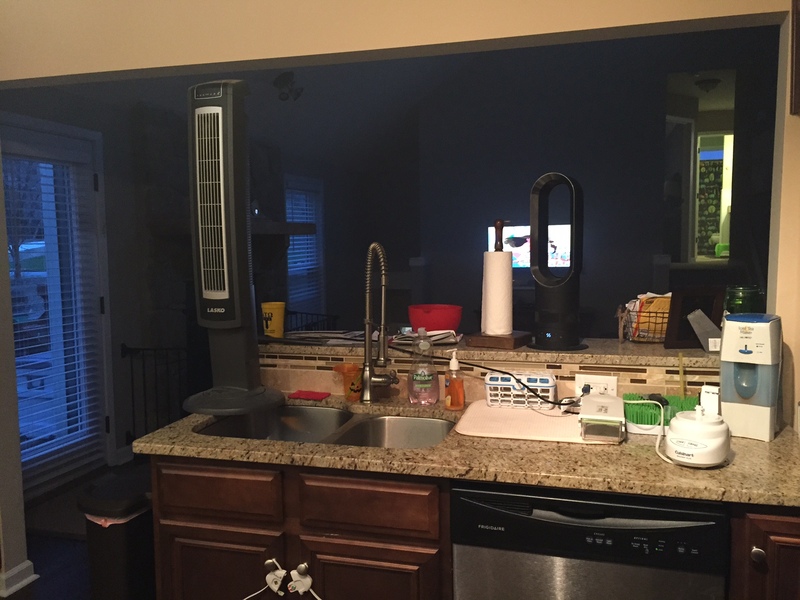 For bigger ones, people recommended 1.5 min, so I cut it down to 1 min per side. 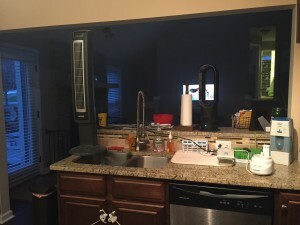 All the while…smoke was filling our main floor…oops. Josh came in with fans and opened windows to try and air things out. When the scallops were finished, I chopped up the second shallot (with the food processor and the burning eyes…again) and placed them, along with the spinach in the cast iron pan and let it wilt. 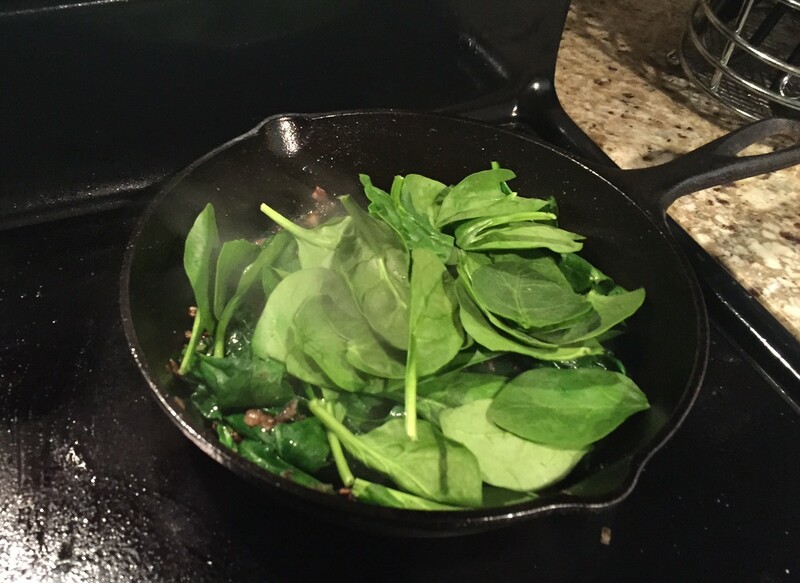 When the risotto and spinach were finished, I plated the meal – excited, yet nervous, to see how it all tasted. Last look before first bite! This is definitely not a weeknight dinner. It took a lot more time than I planned, but it was a nice challenge. Amy – 5 out of 5 stars. I would definitely make this again, for a special occasion. 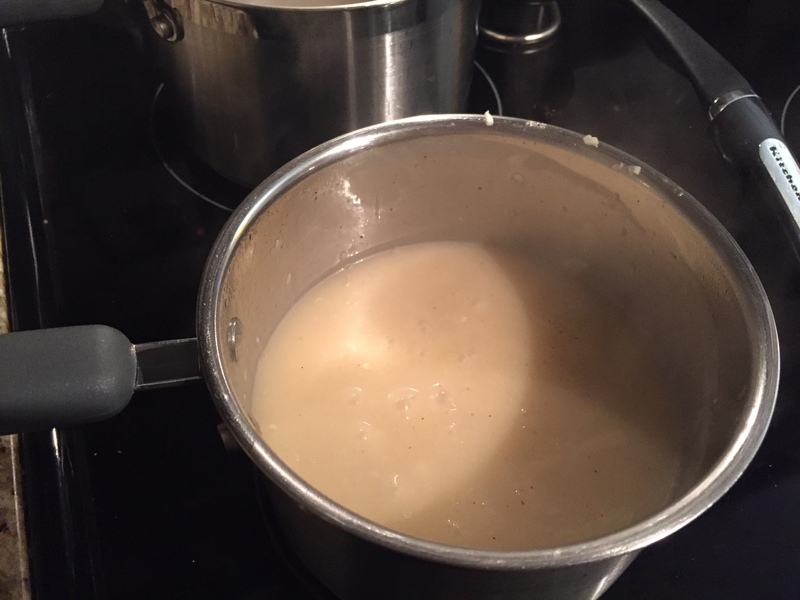 My friend Jamie noted that she makes the risotto more frequently than the scallops, I could totally see doing that as well. Josh – 4.5 out of 5 stars. Josh loved it! He said he took .5 away for the smoky house (jokingly…I think), but really enjoyed it. Honestly, I think he might have been a little impressed (I know I was!) with how it all turned out. Yay! So glad y’all both enjoyed it! 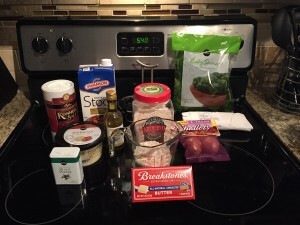 Have you ever tried refrigerating onions/shallots before chopping? Cutting onions always makes my eyes water profusely, but chilling them beforehand seems to help! I haven’t heard of that trick! Will have to try that next time! 🙂 Thanks, Jamie!